(3) Mask Clearance. After the gun(s) has been laid, the leader must determine whether or not the entire cone of fire will clear the mask, if mask clearance is not obvious. In order to ensure mask clearance, the leader has the gunner sight on the crest of the mask and re-lays the MK 19 for elevation on the target. The gunner ensures that the difference in elevation from the MK 19 to the target and from the MK 19 to the mask is at least +10 mils. The gunner checks this by sighting along the bottom of the receiver and the barrel. Figure 5-25. Aiming-point method for elevation. NOTE: The procedures already discussed aid in the initial lay of the gun. The best tactical application of fire from the defilade position is in defense when time is not a factor, especially in a reverse slope defense. Leaders should try to register their MK 19s on selected TRPs, as previously discussed. Use trial and error to adjust for accurate fire from the defilade position. While the MK 19s are being registered, every precaution must be taken to guarantee troop safety. (4) Adjustment of Fire. Under field conditions, the MK 19 that is quickly laid on the target seldom results in an initial impact directly on the target. Rapid adjustment of fire is essential. This is assured by thoroughly training the observer to estimate range and lateral distance. The observer should be in a position to see the initial impact. To ensure this, the burst (three to five rounds) should be long. Except for long ranges, or when for other reasons visual observation is hard, the observer does not ordinarily use binoculars for the initial burst. If the initial lay is incorrect, the binocular's limited field of view can cause the observer to miss the impact of the round. Adjustment of fire should be bold and aggressive. The observer should command large corrections and avoid creeping fire toward the target. When a burst is incorrect for deflection and elevation, the observer's next command should correct both. 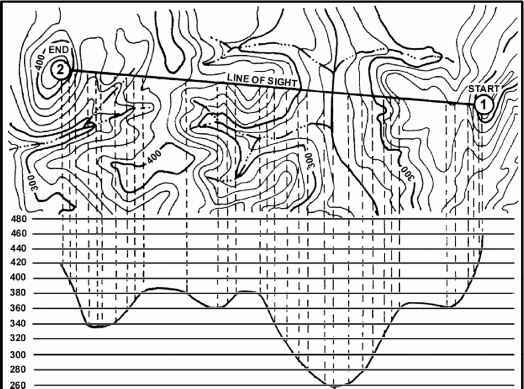 f. Construction of a Terrain Profile. 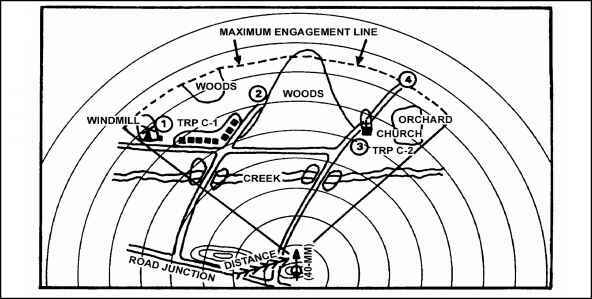 The leader may use a side view or cross section of the ground along a selected line or direction to determine where friendly and enemy forces can see each other. The leader can also use it to plan fires; that is, to locate dead space, to plan a defilade position, and so on. 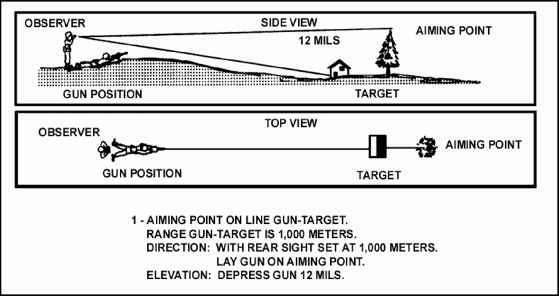 To construct a terrain profile, locate the gun position on the map and determine the direction of fire, or profile line (Figure 5-26). Figure 5-26. 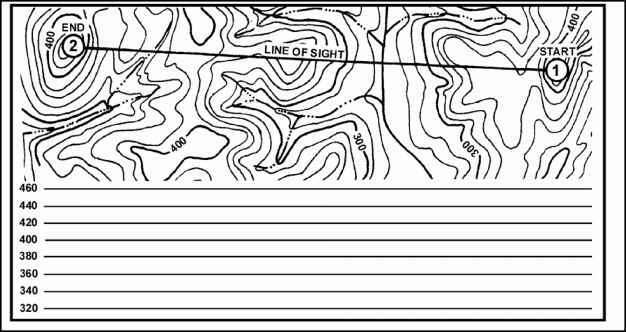 Profile line (map contour lines are 20 meters). (1) Place the edge of a lined piece of paper along the profile line. Tick-mark all points of known elevation on the edge of the paper. These points are the contour lines. Any paper with evenly spaced horizontal lines, such as graph or notebook paper, may be used. The wider the spacing of the lines, the greater the vertical exaggeration in the profile; however this does not affect the information. (2) Draw perpendicular lines, down across the horizontal lines for each marked point, and identify the high and low points along the profile (Figure 5-27).